Genuine Solid Log Cabin. Modern kitchen stainless steel appliances, all wood inside and out. Spacious great room with wood burning fire place. A split floor plan with king size master suite with private bath. Additional 2 large bedrooms with queen size beds and additional bath. Wooden spiral staircase takes you to the loft. Enjoy your evening BBQ outside on the large wraparound gated deck designed to keep pets and children safe. Perfect place to relax after a day of hiking and sightseeing. Completely furnished! All kitchen accessories, just bring the food. Wifi with satellite TV. You will enjoy the quite sanctuary and beautiful golden hue of the interior especially in the evening with the fire place flames flickering off the logs. PETS WELCOME WITH NO ADDITIONAL FEES. NO CLEANING FEE. NO EXTRA ADMINISTRATIVE FEES. Beautiful mountain side property, located in a quiet small development. Across the road from the Apple Valley Golf Course, and minutes from Rumbling Bald Golf Course. PLEASE NOTE THAT WE ARE NOT LOCATED IN RUMBLING BALD AND DO NOT HAVE FREE ACCESS TO THEIR AMENITIES. The location of this beautiful cabin is perfect for all activities. Golf, swimming at the Lake Lure Beach, precious gem hunting, zip line, hiking at Chimney Rock State Park, exploring the shops and restaurants of Chimney Rock. Visiting downtown Asheville, the Biltmore Estate and Biltmore Village. Bathroom 1, located in Master bedroom. High top table seats 4, plus there are 4 bar stools at the kitchen counter, along side the dining area. Wrap around deck with gates to keep pets and kids inside deck. Located in a small private development, across the road from the Apple Valley Golf Course. Many local restaurants ( Lakeview, Point of View, Larkin's on the Lake, La Strada) just to name a few. Only a short distance from the Lake Lure Beach, Chimney Rock shopping and the Chimney Rock State Park. Lake Lure marina offers canoe, kayak and paddle boat rentals as well as guided boat tours. There are many small towns within driving distance for your day trips. ( Rutherfordton, Hendersonville, Columbus, Tryon, Landrum, Saluda, Marion, Black Mountain, Approx. 45 minutes from Asheville, with easy access to the Blue Ridge Parkway). We are only a short distance from the Rumbling Bald Resort, but we DO NOT HAVE FREE ACCESS to their amenities. There is a fee for public use of their facilities. House was beautiful and well equipped with everything that we needed for our vacation. Location was fantastic. Easy to get to and close to many of the area’s attractions. Beautiful and so much to see. Very cozy and very accommodating for our extended family and dogs. We hit the weather perfect, cool fresh air. Saw lots of waterfalls. The patios we're great with all the gates. Definitely would recommend to friends. Very quiet neighborhood, I would definitely stay in this property again. This was one of my favorite cabins thus far using VRBO. Denise, the manager is super friendly and quick to respond. This cabin is in great proximity to Lake Lure, Asheville, and other scenic areas to explore. Our daughter loved the loft area and the living room was large enough for both of our kids to play. Convenience is everything here as you have all you need. The only thing this cabin lacks is a nice fire pit. Neighbors are just far enough away, and are very quiet. 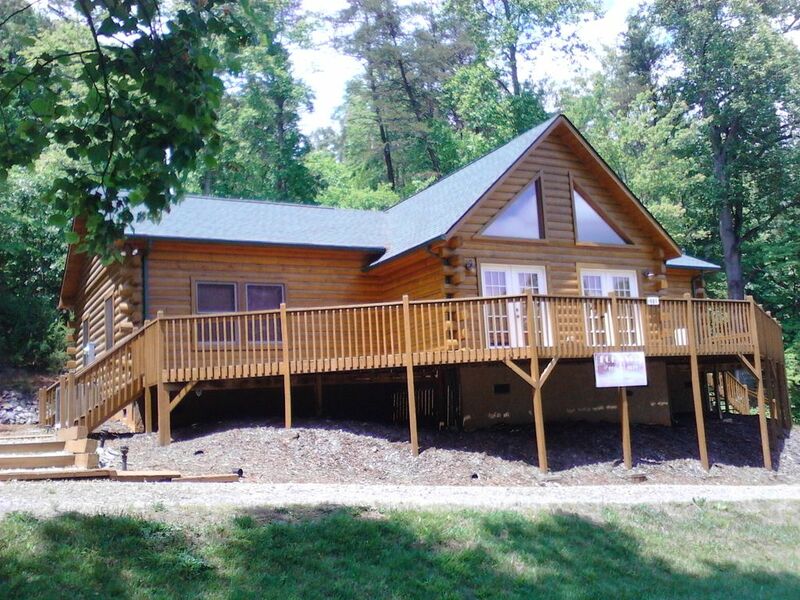 If you are interested in the Lake Lure/Chimney Rock area, this cabin would be a must to enjoy. very nice, clean and comfortable. Easy to get to and convenient to everything. Beautiful cabin. Easy driving distance to Lake Lure and Chimney Rock. Could use some more baking dishes, we had to go buy some disposable ones. Overall great experience. Gem hunting. Area has many Gem mines open to the public. Close to two 18 hole and one 9 hole golf course. Zip lining and kayak at nearby Canopy Ridge. Hiking at Chimney Rock State Park. Rates are based on 4 adults, additional $7.00 per adult. EXTRA CHARGE DOES NOT APPLY TO CHILDREN UNDER 16. Pet friendly with NO EXTRA CHARGE FOR PETS. NO CLEANING FEE. No hidden fees, this does not apply to book it service fee. $200.00 security deposit required at booking. Full rental is due 20 days prior to arrival. Rates are subject to change until reservations are confirmed. High Season and Holiday weekends require a 3 night minimum. Some 2 night stays will be considered in low season. Check in time is 4:00 p.m Check out time is 10:00 a.m.